Have you read this book? If not, here's a video clip to introduce you to August. This is such a wonderful read aloud for our fourth through sixth graders. It's about Auggie Pullman who was born with a facial deformity. For the first time in his life, he's going to attend school with his peers. This book is about friendship, love, courage, empathy, character, bullying, perseverance and always being just a bit kinder than necessary. I created a close reading guide for the book. Close reading will be an integral part of teaching with the Common Core. Students need to know how to be analytic when reading texts and poems. In the close reading guide, I have outlined the components of authentic literacy and what it looks like in the classroom. I formatted the unit as follows. It begins with an explanation of close reading and how to format a lesson. Then, there is a story summary, themes listed and character descriptions. After that, I created focus questions for each chapter. There are explicit gradual release formatted lessons sprinkled throughout. I included a close reading sheet for each of the explicit lessons. You could use the focus questions to create more close reading lessons using the blank templates or for class discussions. At the end, there is a blank sheet for planning and to use with close reading of different chapters. It's $9.99 for a great resource. I hope your students enjoy it as much as my students did. This isn't a bunch of worksheets as I don't teach that way. This is for going deep with the literature! I found this great tumblr about it called choosekind. It's got a list of R.J. Palacio's author tour dates. Maybe she'll be coming to a city near you! You can also send an ecard. 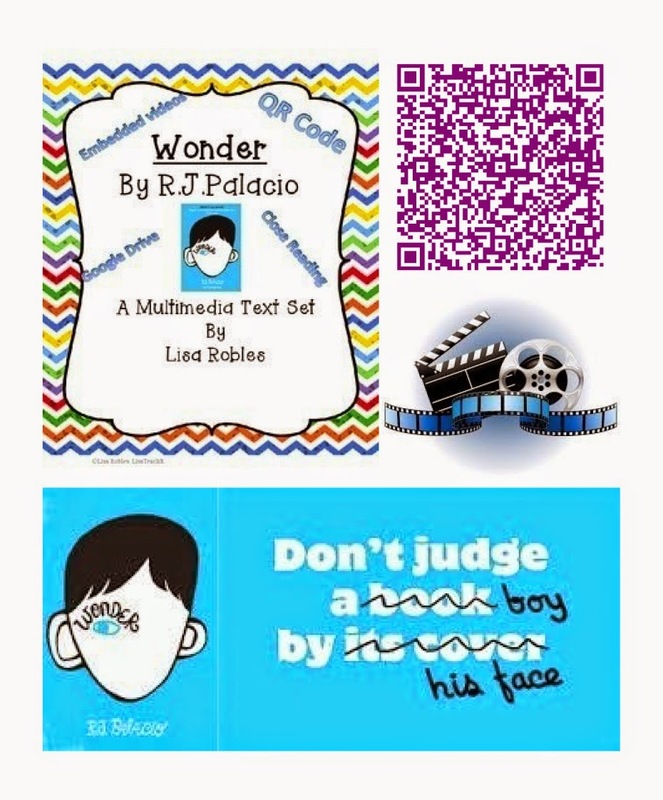 R. J. Palacio also has a website that you could use as a resource. You could even buy The Julian Chapter to extend the book. It's $1.99 on Amazon. I also made a multimedia text set. It was my first attempt so it's a freebie for you! It has a QR code and links to activities. A new way to incorporate tech into your day and free you up to work with a small group that needs some extra attention. I hope you give Wonder a try. It's a great book. The close reading guide will help you incorporate the CCSS into your instruction. "Fantastic resource to go along with an exquisite book." "Very thought-provoking questions which is exactly what I was looking for. Thank you!!!" "Perfect for close reading - Thanks!" "What a great resources! My students are enjoying the lessons!"